Moving better is simple, not easy. Moving better is about learning how to get your body in alignment. Alignment is about awareness. Awareness is about staying in touch with where your body is in space as often as possible. 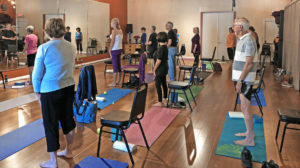 On Sunday, October 7, 2018, I did my first three-hour Dynamic Aging Workshop in my hometown. 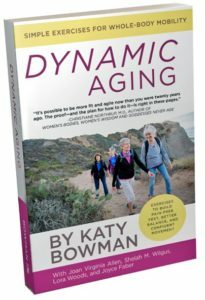 It was all about alignment and movement based on our book, Dynamic Aging: Simple Exercises for Whole-Body Mobility, co-authored by biomechanist Katy Bowman. The book shares the stories of four women, then in their 70s, who are able to move more because they have learned to move better. We are those four women and co-authors of the book – Joyce Faber, Shelah M. Wilgus, Lora Woods and me. Physical limitations are not necessarily a “normal” part of the aging process. Habit patterns out of alignment repeated over many years can create negative physical results. Examples of problem areas can be backaches, foot, knee and ankle problems, hip issues, shoulder and neck restrictions. Even constipation can occur due to a lack of proper biomechanical alignment and a sedentary lifestyle. When these habit patterns are changed, physical limitations can be changed. That is the story each of us shares in the book. This blog continues the stories of how each of us are dynamically aging. Three of us are now in our 80s – Joyce, Shelah and me (Joan). “Baby sister,” Lora, is 77. We have learned aging does not have to be a downward spiral. I reversed chronic constipation. Lora did away with her restless leg syndrome. Joyce alleviated severe neck pain. Shelah learned how to move despite debilitating scoliosis. The purpose of the Workshop was to teach the basics of alignment and moving better. We started with stance. Stance is the foundation of everything we do. And it is simple as long as you are willing to cultivate your awareness of how you are standing. We started by learning proper foot position. Then the optimum width between our feet for our individual bodies. And where to carry our weight. We practiced how to “ramp” our heads and “drop” our ribs. We even learned how to bounce our knee caps. One lady asked doubtingly, “Why do we need to be able to bounce our kneecaps?” Great question. Because they reflect what our quadriceps (muscles in the front of our thighs) are doing. Why do we care? Because knees that are perpetually locked can cause damage to the cartilage in the knees. We learned the pelvic list to strengthen our hips and ankles and improve our balance. There are different ways to sit in a chair in alignment to minimize backaches. Sitting less and standing more is great. For example creating a standing work station is a great idea – just don’t stand there in one position for too long. The key to optimizing our physical abilities is to move more. No one position – sitting or standing – is beneficial over long periods of time without moving – changing positions – regularly. We learned how to stretch our feet over a tennis ball and how to stretch our toes. And how to stretch the tops of our feet. Balance is an integral part of dynamic aging so exercises for upper and lower body help keep us stable. Getting up and down from the floor and working our shoulders, upper and lower backs moves more of our bodies. We noticed that a relaxed hand may have fingers that curl in a relaxed position. Finger stretches help to counteract the tendency of seldom-used muscles to shorten. 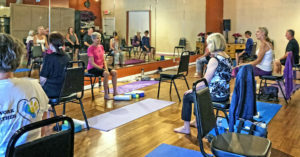 Sitting in our chairs and learning how to twist in an aligned position continues to work those core muscles even with back-up cameras in our cars. All of the science that backs up the biomechanics of these moves is explained with a dollop of humor by Katy in our book. Each of the exercises we did at the Workshop can be found thoroughly described in the book. And, if you would rather not invest in the book, you can follow our blog. In most of the posts, exercises are discussed and referenced to Katy’s blog on her website. So for complete instructions, all you need to do is click on the links provided in the blog posts. In the experience of we four women, we have found three keys to dynamic aging. First, moving better (in alignment). Second, moving more (using our awareness and creativity to change habit patterns). Third, moving more of our bodies (learning how to utilize the unique functions of each part of our body for whole-body mobility). Moving better is simple as long as you work on your alignment and develop your awareness. That’s the “not easy” part. Can’t wait for next workshop- this one was great. Congratulations Joan ! This is a wonderful blog post .